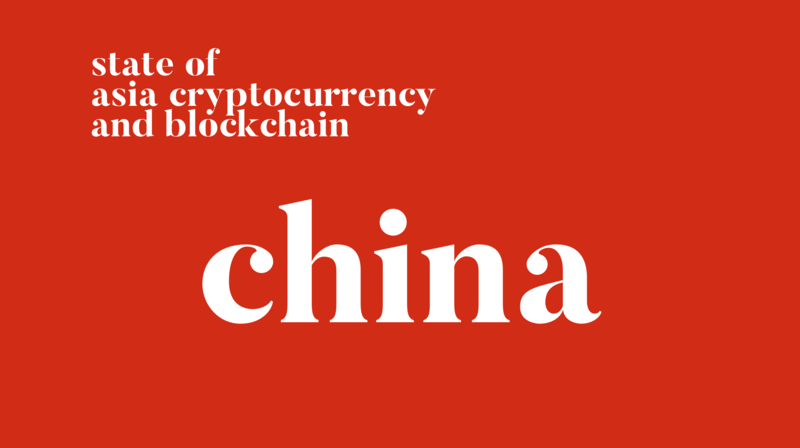 State of China- November Edition – We help you think smartly about the crypto and blockchain landscape in Asia 5-10 years out. We are rolling out a new post series for our Premium readers. It will feature recurring updates on the state of Asia Cryptocurrency and Blockchain. We have come up with 4 high-level topics, and every week we will be writing about one of these topics, and rotating through them in the following order. Let us know your thoughts on this initial piece, and how we can improve! China’s Cyberspace administration has been pushing for an acceleration of blockchain standards this month. Simultaneously, in the background, it’s swiftly gathering user information, centralizing data and shutting down user accounts from large tech companies- Baidu Alibaba and Tencent and others. Regulators have also been making moves on educating and implementing its internet practices internationally. We are seeing a new digitally-enabled governing central power unveiling before us. Secondly, China’s Central Bank continues to clamp down on ICOs to maintain financial stability, and this month made an effort to include airdrops as part of the warning. The bank’s frequent, published opinions on the crypto market continues to impress me. It demonstrates an understanding of the nascent crypto market and expresses its effort to become an international leader in the space. Lastly, financial institutions have been the ultimate adoptors of blockchain technology, and we are seeing that in Hong Kong and mainland China. China continues to be a strategic focus for companies such as Huobi and Ripple. Blockchain push and implementation appear to be accelerating at the central government level: In the last month, the Cyberspace Administration of China (CAC) ministry has called for ‘acceleration’ of blockchain standardization. The same ministry highlighted that the standardization work began as early as 2016, with the publication of the Economic Summit of China Development Forum 2016’s white paper, which stipulated five categories for blockchain standardization: foundation, processes and method, interoperability, business and applications, and information security. “As of May 2018, it [the forum] reportedly completed ten international blockchain standards such as terminology and concepts, reference architecture, classification, and ontology, which have now entered development stage. While blockchain standardization work continues to “deepen,” the text highlights that several hurdles still impede its completion, slowing industrial-scale development. These reportedly include “misunderstandings,” or an “immature and imbalanced” view of the technology’s application across various industries and scenarios, and insufficient cultivation of blockchain talent, which it notes is especially needed to train standardization practitioners. While leaders such as Zhou Ping under the Cyberspace Administration of China advocates for acceleration of blockchain standards, the same organization is also making way into laying the groundwork to gather data from various internet companies and channels, to put onto eventually what I believe will be a blockchain. “The Cyberspace Administration of China laid out the new rules, due to come into effect on November 30, in a notice published on Thursday. The new requirements will apply to services including online forums, blogs, microblogs, chat rooms, news providers, short or streaming video platforms and information-sharing apps, among others. The rules apply to all companies providing such services could influence public opinion or be used as channels to spread social movements — a group that includes virtually every major tech company in China, chief among them Alibaba, Tencent and Baidu. Companies will be required to demonstrate that they have taken measures to log users’ real names, account numbers, hardware details, chat and call logs, online comments and a host of other personal data. The companies must establish systems for reporting to the authorities. This is significant. We are seeing a change of hands of consumer information, with the ownership and power being gradually being taken away from the largest tech conglomerates such as Alibaba, Tencent and Baidu. I wrote a piece earlier this year about how I thought the BAT (Baidu, Alibaba, Tencent) cohort of companies were going to be the winners of crypto in China, given that they would directly benefit from holding a mass amount of consumer information and as well as having formed a close relationship with the government. Now, both of things continue to be true and probably be even more so, but where the actual value will accrue and who will be in ultimate contro is being put into question. I still think that BAT and similar companies will continue to provide value as technology sandboxes, and serve as intermediaries and “user interfaces” if you will, to the central government’s blockchain. They will continue to be very profitable businesses and generate significant returns, but now I think the central party regulators are going to get a big chunk of that pie as well, and pretty quickly too. How do we know that this is really happening? Well, one recent development from the Cyberspace Administration of China (CAC) demonstrated that they haven’t been fully satisfied with BAT, and expect more extensive influence of what is allowed on the internet. Earlier this month, CAC launched a campaign to crack down on illicit activities on social media, including spreading rumors or pornographic information. “More than 9,800 self-media accounts, referring to subscription-based accounts that are popular on WeChat, Weibo or news portals such as Toutiao, have been punished in the campaign that was launched on Oct. 20, said the Cyberspace Administration of China (CAC). Additionally, the CAC summoned social media platforms, including Tencent’s WeChat and Sina Weibo, warning them against neglecting their duty of managing self-media on their platforms. Explicitly saying: ‘Self-media should never be a place outside of judicial reach’. During my interview with co-founder of Earn.com Lily Liu, we recently touched on China’s plan of building an international sphere of influence potentially through blockchain and the country’s One Belt One Road Initiative. Be sure to check it out the notes here and the audio here. In the last month, the Chinese government continues to crack down on ICO activities and attempt to maintain economic stability, In particular, People’s Bank of China (PBoC), the country’s central bank, made a note to highlight airdrops, or free distributions of crypto tokens, in its 2018 financial stability report, as an additional form of ICO. Additional commentaries that the central bank made this month mentioned that the bubble in blockchain investment and financing is obvious, and called on governments to strengthen their supervision to ward off financial risks. In fact, throughout the whole month, the regulators continued to call out warnings on cryptocurrency risks. Separately but related, the public tone of the regulators and the media continues to be pro-blockchain driven without any mention of tokens. Recently, the Chinese National TV recommended Andreas Antonopoulos’ “Book on Bitcoin” and renamed it into “‘Blockchain: The Path Towards Digitized Assets”. Nevertheless, they left the book’s content unchanged. Since China banned ICOs last year, and more recently banning various ICO marketing activities in August, the Chinese regulators have proved to the public that they have been staying cose to the space. They are providing ongoing messaging to protect the retail consumers, but also to prove themselves as a thought leader. By providing ongoing commentary and insights on the crypto ICO activities and market landscape, they want to seize the opportunity to play a key role in the international development of blockchain standards, all the while drawing upon and reformulating these international standards for China’s situation. We are seeing private blockchain activities flourishing in China on the banking and finance side. This month, the Hong Kong Exchange has turned to blockchain to help international investors trade mainland Chinese shares via the Hong Kong’s Stock Connect system. The Stock Connect has been a crucial piece to allow International investors to buy mainland company shares. While HSBC, BNP Paribas, Standard Charter, also launched a Hong Kong blockchain trade finance platform. Banks in mainland China have also been very active in launching blockchain products. Chinese banks (The Bank of China, China CITIC Bank and China Minsheng Banking) have jointly launched a forfaiting trading platform based on a consortium blockchain, with transaction volume reaching 30 million yuan (US$4.3 million) on the first day it went online. The Hong Kong stock exchange and financial markets have long had been catering to an institutional investor group, which is very different from China’s stock market that continues to be primarily retail driven. The Hong Kong banks are actively testing out institutional blockchain technology while attempting to open up trade as part of China’s open economy initiatve to welcome foregin investors. The banks in China are using building blockchains to connect to each other and transfer information more seamlessly. This will take some time but I believe will be significant down the road. It’s important to know that all the large banks in China are state-owned or largely state owned, and what may appear to be a technology upgrade is actually what I believe part of the larger plan for the banks to eventually bring monetary and transaction processes and records all online, and down the road, the money itself as well. On the local government level, we are also seeing regulators vying for blockchain visibility. The “Guangdong, Hong Kong and Macao Dawan District Blockchain Alliance” has been established to promote synergy and innovation and jointly promote the development of the blockchain technology. D. Quick News Commentaries: Ripple’s looks to be active in China, Huobi creates a new committee to work China’s communist party, mining commentaries on social media and recent trading regulations. Ripple moves into China with American Express and LianLian Group entry and providing reach to XRP-powered xRapid through multi-hop; company was also hiring for a head of China Operations. Ripple is a financial tech company with a token, and I am just going to call it that. But they have been going around parading the “blockchain and crypto” flag to justify partnership with businesses and form alliances in a number of international countries, many of which are in Asia. It’s certainly been working and it is too big to ignore. Just this week, there was a mention that Exchange Huobi has created a new committee to work with China’s Communist Party. The company finds that “it was necessary to implement” Communist Party principles and policies into private companies and maintain its foothold in China. Whether this will end up working is still questionable, but I think is the right type of approach to have. Chinese regulators are not very accessible, and it’s clear that Huobi recognizes the importance of China here as potentially providing it with a competitve edge vs. that of Binance and other exchanges. At this point, there are no official exchanges recognized by the regulators, but that doesn’t mean there won’t be one. Canaan Inc, one of the world’s leading cryptocurrency mining equipment makers, has let its application for a Hong Kong IPO of at least $400 million lapse. Additionally, there have been a number of social media commentaries of how mining machines are been disposed and dumped out after the announcement of BTCC And F2pool mining pool shutdown. My quick take on this is that mining companies are certainly going through a rough period as we are in the bear market, but be assured that mining is not dead. Several mining pools may be dead or dying, and it may be hard to start new ones to combat the existing ones, but mining is certaintly not dead. I continue to hear data points of companies trying really hard to visit mining manufacturers to get their hands on altcoin miners. The ongoing flourishing crypto ecosystem, as well as the recent regulation from crypto funds in Hong Kong, shows that Hong Kong has been a popular place of crypto trading activity, and the regulators are looking to reap benefit. 2 datapoints here, although I am not sure how they accounted for their returns, Hong Kong fund Kenetic year to date. Additionally, Hong Kong’s investment portfolio has announced that they have returned 77% returns in securities watchdog announced plans to regulate Crypto Funds and tax those with over 10% crypto assets. Here is a helpful and digestible post on 10 Things You Need to Know: New Regulatory Framework for Crypto Funds in Hong Kong.